most of the relatively "bright"
Including Sol itself, around 74 "bright" stars (spectral classes O, B, A, F, G, and K) are currently believed to be located within 10 parsecs (or 32.6 light-years) of Sol. Except for some of the dimmer and more distant orange-red K stars, most of these relatively bright, larger, more massive, but rarer stars can be seen with the unaided Human eye in Earth's night sky. While there are no giant or supergiant stars located with 10 parsecs (pc) of Sol, several stars have fused so much hydrogen and accumulated so much helium ash in their cores that they are beginning to swell and emit more yellow, orange, and red light -- changing their spectral type. As more massive stars exhaust their core hydrogen faster, the largest O and B stars in the 10-parsec Solar neighborhood appear to have already moved off the main sequence and relatively brief, giant and supergiant stages to become white dwarfs and possibly as yet undetected neutron stars and black holes). Within 10 pc of Sol, astronomers may have detected planets in the Solar System and at least eight other bright stars (Alpha Centauri B, 82 Eridani, Epsilon Eridani, 61 Virginis, Fomalhaut, MLO 4 / Gl 667 C), Vega, and HR 4325 A), as of October 2012. Other than Sol itself, however, only around perhaps 45 "bright" main-sequence stars of spectral types F5 to K5 in some 37 star systems (including such G stars as Tau Ceti, and Alpha Centauri A) may possibly be capable of hosting Earth-type planets in stable orbits within their respective circumstellar habitable zones (CHZs). Within a CHZ orbit, liquid water vital to Earth-type plants and animals should be persistent on an unprotected planetary surface without tidal locking, orbital disruption from another celestial object, frequent flares and super flares, and other luminosity variations from stars evolving of the main sequence as subgiants, giants, or supergiants. The following celestial objects are located within 10 parsecs, 32.6 light-years (ly), of Sol. 25.1 Fomalhaut A3 V 2.3 Pisces Austrini NSV 14272, dust, planets? 25.3 Vega A0 V 2.6-3.1 Lyra NSV 11128, dust, planets? 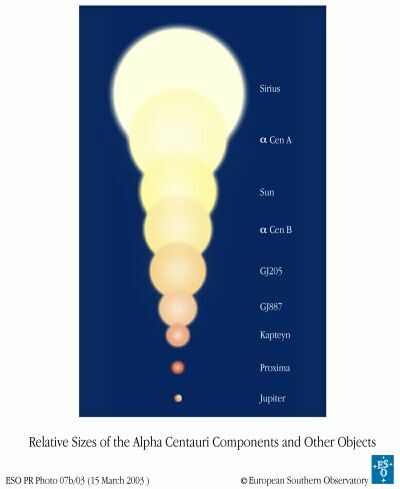 Summary information on red dwarf stars, brown dwarfs, white dwarfs, and all stars and related celestial objects within 10 parsecs are also available. Up-to-date technical summaries on these stars can be found at: the Research Consortium on Nearby Stars (RECONS) list of the 100 Nearest Star Systems, NASA's NStar Database, and the Astronomiches Rechen-Institut at Heidelberg's ARCNS. Additional information may be available at Roger Wilcox's Internet Stellar Database. © 2005-2012 Sol Company. All Rights Reserved.